Looking for favors that let you choose what's on the inside AND the outside? Well, fill this cute and handy tin with confetti, candy, mints and so much more - it's up to you. And, as part of Fashioncraft's exclusive Personalized Expressions Collection, you also pick from an exceptional selection of colors, themes and customized titles, for weddings, showers, or any occasion, to turn them into one-of-a-kind mementos of your big day. 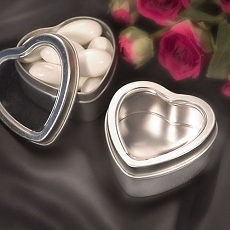 Each 2".25" x 2 .25" x 1" tall heart-shaped tin features a silver metal base and a clear plastic top that allows you to see the treat within and is also perfectly fit for the custom label of your choice. 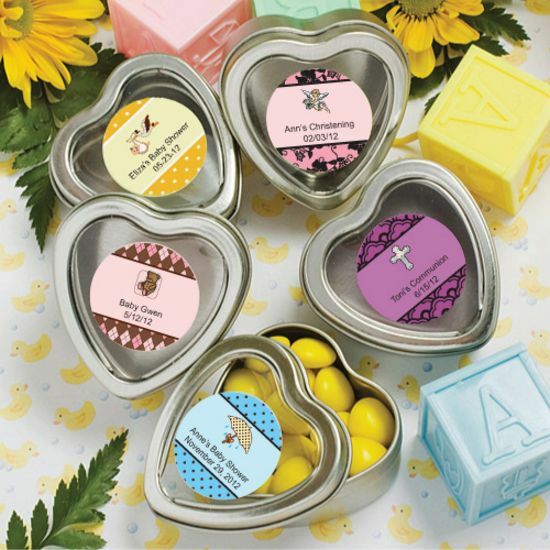 A great choice as heart themed favors or for any love-filled occasion, these favors come bulk packed with self sticking label sheets included for easy application. Please allow 3-4 days for production.